Now that I've gotten that out of my system I can make this post about something different than the incredibly lame decision to make Han shoot first...I digress. I was fortunate enough to get to see this latest big fig duo by Miro78 at BricksLA, and they're a perfect addition to his growing collection. And to discourage my impulse to rail on that decision I referred to earlier I'll offer this fun fact: When the production wrapped in London, they did not bring the live firing hero prop of Han's blaster back to America with them . So when it came time to shoot this scene a new prop needed to be cobbled together. 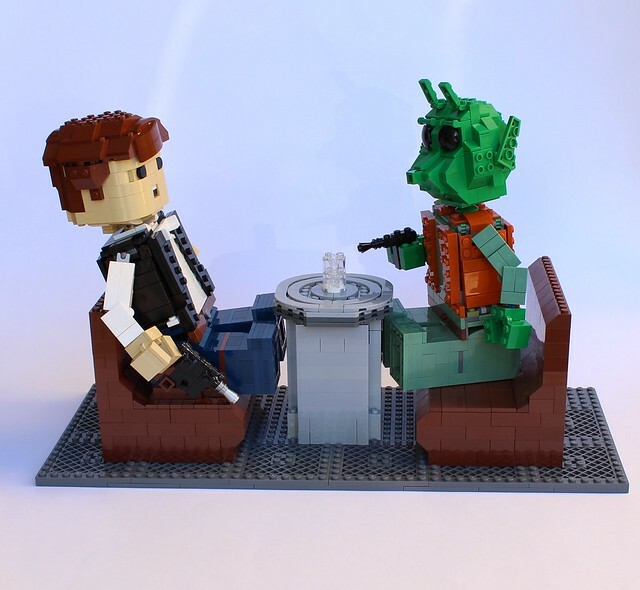 This prop blaster, unique to this scene, is fondly referred to by the prop reproduction community as the "Greedo Killer". And Han used it first.